Something I very much enjoy. But Stina Sternberg thinks she has some problems with me. See her video where she lectures us men on how not to act like we’re self-centered five-year-olds. Then continue reading. 1. What’s with the cart? If you’re under 75, and not lame or injured, what are you doing in a cart anyway? Are you too delicate to walk, or out too of condition? Forget the cart. Enjoy the outdoors! That’s one of the reasons we play golf instead of going bowling. 2. No, Stina, I am not guilty of this. I have never given unsolicited advice to a playing partner I have just met, or a friend who knows how to play the game, and it’s rather sexist of you to imply that all men all do. But when my wife, who is just learning the game, lays up sod for the fourth time in a row because her weight is so far back on her right foot that she’s almost falling down and she is getting more upset each time, I think I am qualified to remind her to get her weight over to her left side, which she does the next time and she starts hitting good shots again. 3. Are you kidding? Someone would intentionally stop another player’s ball? Nothing to say about that one, but as for giving putts, I’m not going to give you anything. Golf is played from the tee to the hole. And as for taking excessive shots, if a woman is taking so long to get up to the green that there are now two empty holes ahead of us (this has happened to me), I will suggest that she take four swings, then pick up. I said this fifteen minutes before the marshall caught up with our group and told her the same thing. 4. Expressions of anger. Right on, but women don’t own this issue. It doesn’t cut it with us guys, either. Make a habit of this and you’ll find yourself playing solo. 5. Good point on the gambling. I take what I win with pleasure from whomever owes it to me. Now here are a few rules based on my exeriences, regarding things that I see women do, but not men. 1. Don’t step in the line of my putt. And when your female partner you came to the course with reminds you not to do that, don’t keep doing it. 2. If you’re going to call a rules violation on me, you’d better know what the rule is. I carry a rule book in my bag, and I’ll ask you to show me, right there and now, and I won’t care if you’re embarassed when what you said isn’t in the book or you’re wrong. Same thing goes for procedures. Even around the green, the person farthest from the hole plays first, regardless of whose ball is on or off the green. 3. If we’re playing for money, and you’re hitting short irons or wedges into the green on all the par fours while playing from the red tees, I will suggest that you move back. The red tees are to equalize play, not to provide an advantage. 4. When you have holed out, get off the green! We’re in the fairway waiting to hit. Save your chatting and score-keeping for the next tee. Leave your pull cart on the side of the hole closest to the next tee you don’t have to go all the way across the green to get it and go all the way back across. 5. Extra one for Stina: When we get sent off together, don’t think that I am likely to be an idiot like the guy in the video and I won’t think you’re likely to be a prima donna. All I want to do is have fun and enjoy your company for four hours. Until then, keep your head down and your left arm straight. 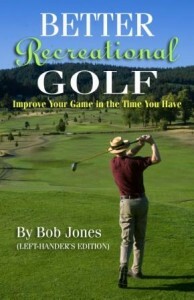 This is a message for everyone who wants to get become a better golfer: play with golfers who are better than you are. Much better. You will not improve if you don’t, no matter how many lessons you take, no matter how much you practice. Now it sounds like I am about to urge you to take lessons to acquire the solid foundation Boomer is talking about. I would never advise against that. But I am concentrating on something he mentions in the first sentence of this extract. That is the conception of golf. What is your conception? 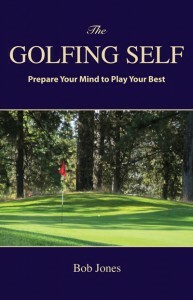 If you are teaching yourself, your notion of what can be done on a golf course is limited by what you can imagine. You will eventually rise to meet that notion, but that is all the farther you will progress. Because you cannot imagine what it means to play better, you will be stuck where you are, trying to perfect your limited idea of golf. The only way to break out of your own mold, in my view, is to play with players who are much better than you. More than in terms of score, I mean in terms of skill. Take the best shot you can hit, that you hit several times per round. 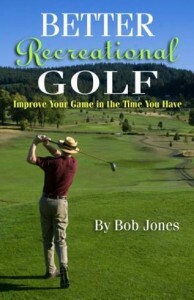 Play with players who hit better shots than that, and hit them time after time–as the typical way they play. They not only hit better shots, they hit different shots that never occurred to you as possibilities. They’re playing a different game than you are. It takes that to open your eyes and give you a new direction to take your learning and your practice. Then you can go get those lessons and put in the practice time because you have a goal in mind. You’re working toward something that has real meaning and will make you a different golfer, rather than being better at the some old things. So many errors in the swing come from the upper body and the lower body not moving together in a coordinated way. If the lower body gets too far ahead on the downswing, the arms will be left behind and the clubface will come into the ball wide open. If the upper body leads, weight cannot return to the left side. Weak, off-target shots result. Try this image to keep yourself connected throughout the swing. Imagine there is a string going from your left hip straight to your right shoulder. That it goes through your body doesn’t matter. Pretend your body is transparent to this string. When you swing back, the right shoulder has to turn back behind you. Because the right shoulder is connected by this string to the left hip, the left hip will be pulled around, too. All the slack is out of the string. Now on the downswing, it is the left hip that leads. As it slides and turns into the ball, it pulls the string and the right shoulder turns with along with the hip. Nothing gets left behind. Your body stays connected, and the clubface gets delivered back to the ball square and on line. They say you don’t learn anything when you play well, only when you play poorly. I say, Nonsense. When I play well, I learn how to play well. When else do you learn that? I shot a 75 today. This is what I learned. 1. Don’t hit a shot until you’re ready. That means you are at ease with what you are about to do. If you have any misgivings, or doubt, or something just doesn’t feel right, step away. Clear your head, and step up to the ball again. 2. Play within yourself, especially off the tee. Play easy and believe in what you’re about to do. 3. Read putts by looking uphill. If you’re putting uphill, read the green from behind the ball. If you’re putting downhill, read from behind the hole. The slope of the hill and the break are always seen more clearly when you look uphill. 4. Find the shots that are working and use them to death. Let the shots that aren’t working take the day off. 5. When in doubt about which iron to choose, take the longer one, grip down a half inch, and fire away.